Watch Ken Reid's uniquely funny Stand Up Comedy in this App. Actually see the pop culture flowing in his veins. In this App, learn all about Ken, find out where you can see him live or watch some VideoKen on your App. You will love this very funny man! 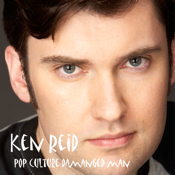 Called a "pop culture maven" by the Boston Globe, Boston native Ken Reid has been performing for over 10 years in various capacities and has been a staple on the Boston comedy scene since 2003. His unique and very personal story telling style has gained him a loyal fan base in the area. Ken was also nominated by the Boston Phoenix as Best Comedian in Boston 2010. Ken has performed at the Charleston Comedy Festival, The AltCom Festival, and The Eugene Mirman Comedy Festival. He hosted and presented at the Boston Music Awards, was the Comic in Residence at The Comedy Studio in September 2006 and was a founding member of comedy troupe The Untrainables. With the Untrainables he hosted and co-produced the "Great and Secret Comedy Show" at Improv Boston from 2006 until 2009. He is also the creator of "Lafta Obscura" a unique comedy show at the Paradise Rock Club that ran during 2006. Recently Ken toured as the opening act for Todd Barry during Barry’s “Substantial Tour of New England”, was chosen by Eugene Mirman as the opening act at Mirman’s record release show, opened for Patton Oswalt at the Wilbur Theater, and performed a series of “live talk show” appearances with Jonathan Katz.